“Our parents bring us to you to play a game. Even though we may look like pros in our uniforms, we’re not mini-adults; we’re children! “We don’t have a soccer background. We need to learn from others by seeing and imitating. You are our role model and you must teach us. “We have a very difficult time cooperating with others. Self-centeredness and boastfulness are beginning to decline, but we enjoy group play, showing a preference for small groups. “We are interested in learning. 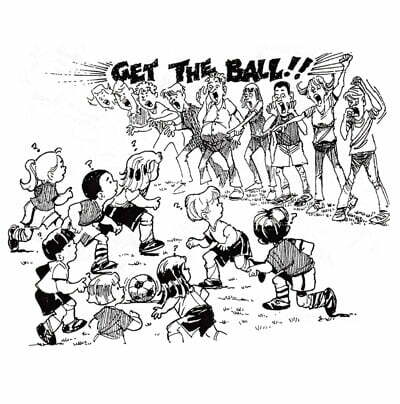 Many of us know our right from our left, and playing soccer is stimulating for us. We like structure and are willing to apply rules. We’re aware of the rules governing cooperative play, but it’s best to use simple rules only. “Remember, we had to crawl, walk, run, jump, and hop in that order, so we will develop our soccer skills the same way. 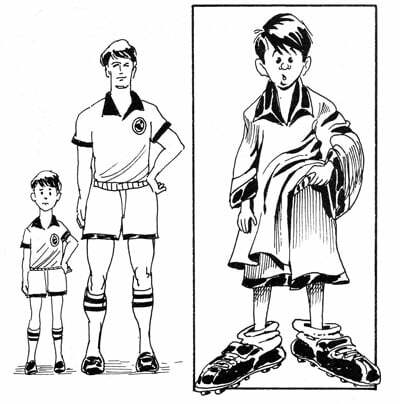 “In general, we will ‘play at’ soccer by imitating rather than actually ‘playing’ soccer. The fun lies in us just kicking the ball rather than passing to a teammate or shooting at the goal. They will attack both goals. They will release the ball too early – they may not release the ball at all. 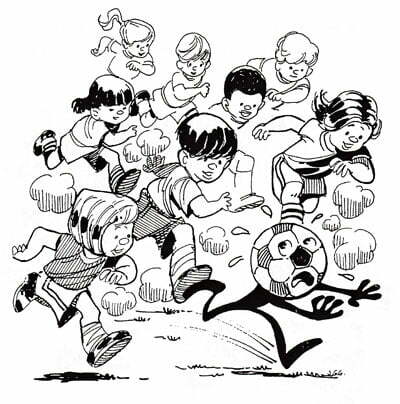 They think that the game ball is their own ‘toy.’ Most children will want to get possession of the ball to score. They’ll react too quickly to the flight of the ball. They may shoot toward both goals. Don’t expect any fakes or feints. They can’t find teammates to pass to. They will ‘bunch’ around the ball and run in the direction the ball is traveling! They will not understand the concept of space, so any encouragement to ‘spread out’ is absolutely pointless. They will happily chase after the ball while attacking and defending. They will run and change direction in short bursts until they get tired. They cannot, and will not, look for space to run into. They will defend both goals. They will kick at the ball with all their might – they may not kick the ball at all. They think that since the game ball is their own ‘toy’, they must get it back. 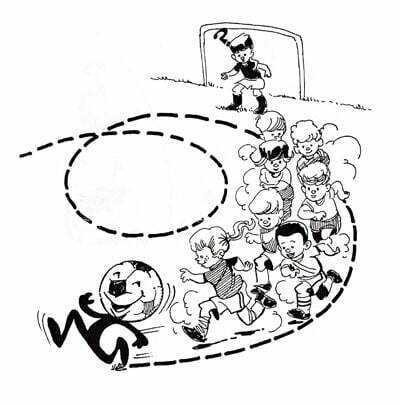 During the game it is more like ‘finding’ the ball. They are not defending a goal but happily chasing after the ball. They may simply watch the ball, or chase after it in the same way, as if attacking. It is a fact that coaching younger players can be especially challenging. 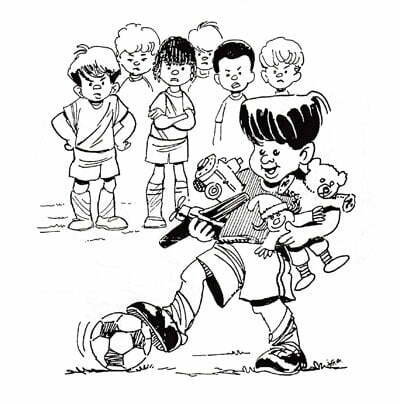 Keep in mind that U-6 players can be impatient and easily distracted. This should be expected. Don’t get frustrated. You can reach and teach all players with the right approach.